Bromley House on Angel Row was built in 1752. The Nottingham Subscription Library is still located on the first floor (photo: A Nicholson, 2004). Angel Row probably derives its name from a public house of the name of "The Angel" which has now vanished. Its traditions are largely residential and it does not appear to have been a trading district until the 18th century was well advanced. It was at his mansion on Angel Row that Samuel Peak died in 1763. He was a very well-known philanthropist in his day and was treasurer and benefactor of the Bluecoat School. Again in 1799 a certain Mr. Thomas Hall lived at his mansion which still remains as No. 6 Angel Row. It will be noticed that the picture shop in front of this house is only one storey high and behind it are manifold remains of the old mansion which was occupied by this gentleman. The gardens appertaining to this house stretched up towards the castle grounds. They were built over soon after Mr. Hall's death and have formed Bromley Place and other thoroughfares in that neighbourhood. There is a curious yard which runs up just hereabouts called Hind's Yard. At its further end are some derelict houses which were evidently built in early Tudor days, but about which I have never been able to find any gossip. Bromley House of course is the great library of this neighbourhood and an excellent example it is of a town house belonging to a great family erected during the 18th century. The early history of the site is exceedingly obscure. There is a certain Red Hall which flits through early references to Nottingham and which appears to have been the Manor House of one of the three ancient manors of Nottingham. It is somewhat muddled up with references to the equally mysterious St. James's Chapel, and I think that the best explanation that one can give of these very fugitive references is that St. James's Chapel was the private chapel attached to this manor and Red Hall, probably the fact that Chapel Bar was erected in the manor which possessed this St. James's Chapel is the real explanation of the meaning of the much-discussed Chapel Bar. It is, I think, pretty generally agreed that Bromley House stands upon the site of this Red Hall. The present building was erected by Taylor for Sir George Smith. Sir George Smith was a scion of the great family of Smith whom we shall consider when we are thinking about South Parade, and he took the name of Bromley and became ancestor of Sir Robert Howe Bromley of East Stoke. Sir George Smith used Bromley House as a town residence for some years and later its lower floors were used as banking premises, it seems to have fallen somewhat from its high estate, for in 1819 four companies of foot soldiers were lodged in it during the troublous times which the town was then going through. Then it was used as a draper's shop, and it will be observed that the present windows on the ground floor are quite modern and are of no artistic interest whatever. Finally, in 1820 it was purchased by the Nottingham Subscription Library for £2,750. The Nottingham Subscription Library is one of the many similar institutions established throughout the kingdom. In the early part of the 19th century the taste for good literature and for scientific research was rapidly spreading and the old circulating libraries were quite unable to cope with the demand for good books and so in innumerable towns these literary and philosophical societies sprang up. The Nottingham Subscription Library was founded in 1816 and appears to have held its meetings in the premises which afterwards became Messrs. Wrights Bank, in Carlton Street. It began life as a book club, the members of which passed the books from one to another after perusing them, but this was found quite inadequate and so Bromley House was purchased by a company formed for the purpose with a very curious constitution. Subscriptions were raised which were capitalised and the capital thus procured was expended in the purchase of premises and books. The shareholders who had provided the capital became members of the library and were entitled to the use of the premises and the books upon the payment of an annual subscription. Bromley House Library has an extraordinarily fine collection of books to-day, many of which are extremely valuable, while the rooms in which it is housed are dignified and interesting in the extreme. The house is beautifully built. 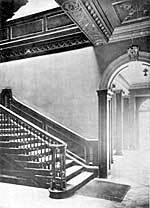 There is a tradition that in order to be sure that it would be water-tight each of the facing bricks was emersed for a fortnight in water before being used, the detail of the house is wonderful and one would have to seek far before discovering a more beautiful staircase than the one which leads to the first floor. It is most easy of ascent, and its decoration, particularly its banisters, is most remarkable. The late Mr. Harry Gill once told me that he had occasion to get a price for a copy of these banisters and the lowest quotation that he could get was £5 a spill. The panelling round some of the rooms is very beautiful and rather instructive, for it so much differs from the old panelling which one would have found in any house built a hundred years earlier than Bromley House. It is so arranged that it forms compartments which could be conveniently used for the display of family portraits which were coming into fashion in the middle of the 18th century. Its fireplaces also are extremely elaborate, one on the ground floor being an enormous, almost monumental construction. Although their workmanship is extremely fine I think that they are rather decadent for they are over-elaborate and are not to be compared with some of the earlier fireplaces of the Adams school which can still be found here and there in the town, and whose better treatment and more sparing use of detail is really very much more restful than these elaborate fireplaces of Bromley House. There are one or two excellent pictures to be found in Bromley House as for example the Duke of Richmond which is attributed to Kneller, and most pleasing of all the charming prospect of Clifton Grove, by Rawson Walker which is surely one of the best examples of his art. There are some curious fitments in the house which speak of the interest in scientific observation which was evinced by its early owner. For example, a weather vane which surmounts the roof is traced right through the building and connects with a dial by the fireplace in the main room of the library so that one can very conveniently tell the direction of the wind without venturing outside, and then in one of the rear rooms of the building is an elaborate system for checking the time of clocks. A ray of light at exactly mid-day pierces a hole in a shutter and throws a beam along a brass mark which still remains in the floor under the oilcloth of the room. By means of laboured calculations this ray of light was used to regulate the library clock and some of these calculations have been discovered thrust away in the case of the clock. Apparently it was one of the functions of the library to keep this clock accurate for the benefit of the town. The garden at the rear with its asphalt paths, sundial and antiquated lawn is a pathetic reminder of the days of crinolines, knee-breeches and powdered wigs, and when it was first laid out must indeed have been a delightful place. It is shaded by great plane trees, and the glimpse through the doors of Bromley House from the busy Market Place to this quiet tree-shaded oasis is really most refreshing, the plane trees are of no great antiquity, for in 1875 six of them were planted by members of the Committee, but most of these have now disappeared and those that are left have been drawn up by surrounding buildings in a very remarkable manner. The Bell Inn has roof timbers dating from the mid-15th century (A Nicholson, 2004). 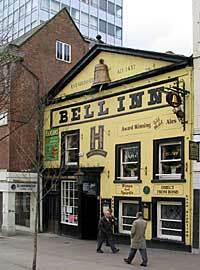 The "Bell Inn," just below Bromley House is an imposing looking building which is first mentioned, as far as I am aware, in 1638, although the present building is much later than that date. It is curious, because in the year 1638 it belonged to a certain Robert Sherwin, presumably one of the Sherwins whose house still remains as we have seen at the upper end of Pilcher Gate. 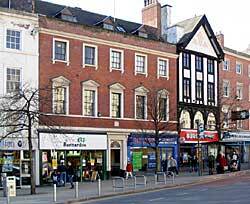 He bequeathed the revenues of a half-part of this inn to be divided amongst the three parishes of Nottingham. This led to all sorts of difficulties and eventually the inn was sold in 1923 for £22,000. It was outside this inn that in 1816 occurred the accident to the Derby coach, whereby Mr. Owen of Derby lost his life. This accident throws a very sinister light upon the condition of traffic in Nottingham 110 years ago, for as the coach was proceeding across the Market Place it struck a rut of such dimensions as to completely overturn it and killed Mr. Owen in its fall.